Interviews should seek to make contact with victims of human rights violations and conflict. JRS a very important point of contact for this. –Name those forms of conflict that are the most important threats to human rights, in your region and globally (e.g. ethnic conflict, religious conflict, nationalism, economic inequality, other). –Name the important threats by conflict or violence to human rights you see emerging today in particular geographical regions. –Name the most important movements for the promotion of human rights in situations of conflict (e.g. Amnesty International, Sant’Egidio community, other). –Name specific networks working for the promotion of human rights in situations of conflict and violence you are involved with locally, nationally, globally. Possible key institutions: UN bodies (Geneva, NY), UNHCR, Amnesty International, Human Rights Watch, ICRC, School of Peace in Catalonia, Univ. of Uppsala, Sant’Egidio, Ploughshares, US Institute of Peace, etc. Identify some key trends in politics that affect human rights in situations of violence and conflict (signs of the times—in depth analysis will be needed for this). Identify possible ways of providing early warning for conflicts that threaten human rights. What do others see as possible key contributions of Ignatian family in this area? Interviews should surface broader and deeper perspectives on human rights in situations of conflict? Position Paper. MK George will coordinate drafting, draft prepared by end of August, 2011. Results of Questionnaire collated by December 2011; L. Chiti will coordinate mapping and interview process. Interviews should be conducted both simultaneously with and following collation of questionnaire. First Draft of Strategic Plan. Prepared by May 1, 2012. Mauricio Garcia and David Hollenbach will work together on this. Specific Workshop: discussing objective of the workshop, but haven’t decided on place/date – will discuss by Skype. 12-15 people but not sure why we should meet. We thought we should meet on Conference level rather than international level; using the money that we are not using for the mapping. Next year, the WSF on Migration will be in Seoul, probably in October, so we were thinking about meeting there. José Ignacio García: Need to approach Patxi once you have clarified your ideas about what you want to spend the money on, for approval. Position paper will be written by two people from Deusto and reviewed by Evelyn from Ghana and Pedro Walpole, then circulated to Core Group, paper to be finalised by Deusto by end of May 2012. 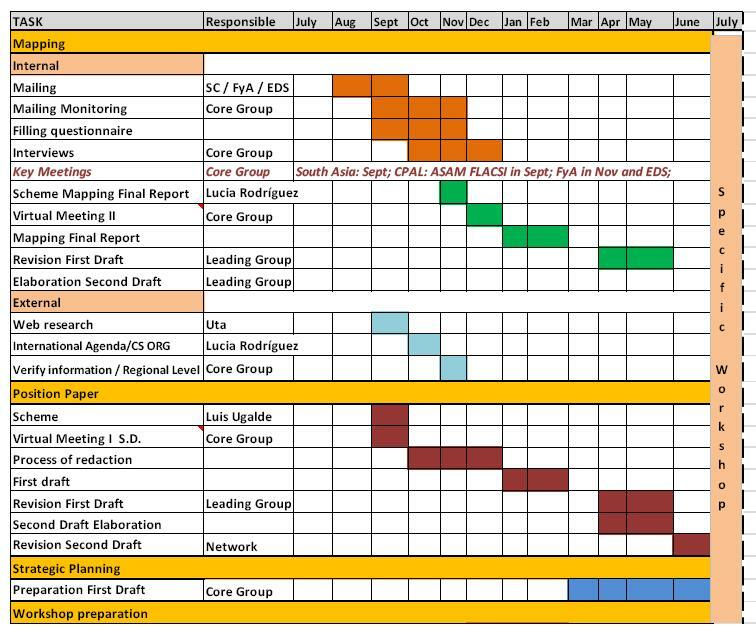 Planning document will be collated from various proposals that we have already formulated, draft planning with help of Christina Kheng, then circulated to members, finalised by end of May 2012. Specific Workshop end of August either in Peru or in Lumumbashi. See the cost before deciding. Interviews: both mapping and interviews will be completed by end of December 2011. Are in the process of formulating a questionnaire for interviews, will be included in final document. Need to invite more people to Core Group through Social Apostolate Coordinators, South Asia and Africa. Nacho Eguizabal: What are the consequences of contact between GNMR & Ecology on mapping? José Ignacio: There are some ways we will help each other to gather information, otherwise probably no. Solomon: we are looking forward to more contact, we have a similar questionnaire, and we invite Pedro to help with the position paper. We were thinking of having the specific ws together, but ecology was in favour of separation. David Hollenbach: A general question: If a genocide starts in South Sudan tomorrow, what do we do? José Ignacio: What Julian meant with “agenda” was planning towards events, conferences. Clearly, the networks do not have capacity for rapid response at this point. The only structure we have is the US Conference, maybe Brussels. Needs to be developed more, it’s a learning process. Networks as they are now are not meant for this, maybe in the future there will be some capacity for that, but it’s not clear if the networks are meant for this anyway, probably not all of them. Patxi: Only JRS is able to respond, question comes up at Curia level occasionally but remains unanswered. Important question for the Society. Don’t have the capacity in the networks now. Pedro: We need to at least give information and be part of the response if there is one, from the Jesuits. José Ignacio: The generosity of people is extraordinary, so several Jesuit Mission Offices gathered and acted together, they have a protocol that they can activate. MK George: Excellent presentations, planning, moving around as a team, hospitality, people. Personal level: being in Loyola. Only anxiety is how is it going to benefit the “last person”, the poor. Thanks to everyone. Walter Fernandes: Very good experience of discernment, atmosphere of listening and responding without thinking of the “baggage” we all bring. Seriousness with enough flexibility to accommodate differences of cultures. Six days are too long. We are involved in so many things, it’s not easy to be away for a long time. Very good experience. Maybe for the next one, perhaps we could have more information about the OTHER networks. This time, it was important to get our own network going, but next time we’d like to know more about what others are doing. Organisation superb, food excellent, Alboan and Loyola staff did a marvellous job. Trevor Miranda: A lot of work went into it. Good mix with group work and plenary sessions. Ferdinand Muhigirwa: Excellent preparation, very good presentations – could have been shorter, half an hour enough. Really liked the Core Group sharing, to reflect, to deepen. Inspiring, challenging, motivating – asking me to go and try to see how to put forward what we have said here. Mauricio García: Was sceptical about methodology, but in the end it worked and we finished in our core group with a good planning. Very well taken care of by Alboan, Loyola, Arrupe Etxea. To be in Loyola is motivating in itself. I ate too much… delicious food! David Hollenbach: Happy with how the meeting unfolded, met a number of new people and have been deeply touched by getting to know them. Also getting some others better, enjoyed being with all of you, consoling. Planning, content, facilities, welcome, support all very positive. Hope that we can keep focussed as we move ahead on the issues that we are seeking to addressed. Spent a lot of time on organisation, structure, method of communication. My group didn’t spend too much time talking about Human Rights so I hope that we keep our focus on what we are really aiming to do, so that we produce results for the people we work for, that’s what we will be judged by. Ferdinand Muhigirwa: Many have left their provinces, lay collaborators… people want to know what we have done, where we have been. Are we thinking of producing a one-page summary of this meeting for others? At the end, we could commit ourselves to take this forward. José Ignacio: Communication will come from the Secretariat, Bellucci has already sent article from press office (mistranslated in Spanish). Interest to follow this. Solomon: South Asia has already decided to write a one-page report for provincials, article in Jivan. Credits: translators. Alboan: Nacho, Mary Tere, Marcos. Martín doesn’t sleep! Remember Dani whenever we switch on Skype. José María for translation, all the best for thesis. Julian Filochowski, Luis Arancibia. Uta & Patxi.